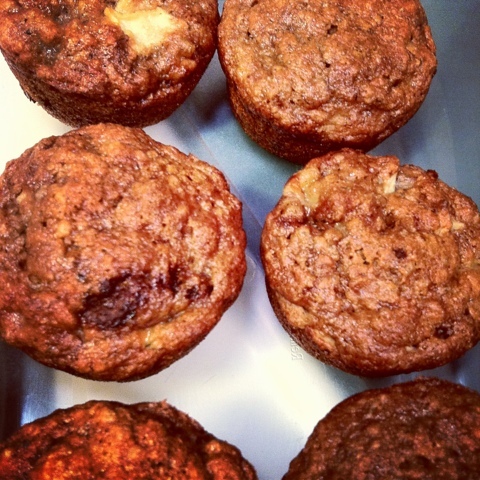 Super moist delicious banana apple muffins! Preheat the oven to 350 degrees and prepare the muffin tins with paper wrappers. Mix together the flax seed meal with the water. Let it sit for a minute or two, then mix again. Mash the bananas and add the sugar, flax seed mixture, apples, apple sauce, vanilla and oil. Mix together. In another bowl, sift together the flour, cinnamon, salt and baking soda. Add the dry mixture into the wet ingredients and combine. Fill the muffin tins up to the top of each wrapper and sprinkle a small amount of cinnamon sugar on the top of each muffin. Walnuts would also be delicious and add a nice bite to the muffins. You can also add different spices like nutmeg, cloves, ginger and allspice to your liking. Recipe by SparkPeople.com user XMUSICALBEAUTYX.